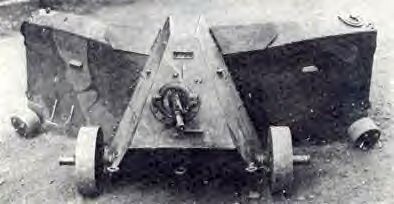 This impractical contraption was developed for the early Japanese campaign in China as a form of one-man “panzer” where the wheeled mobile armor could be used as both a frontal shield for the machine gunner or the sides could be rolled back to cover most of the machine gunner’s body, depending on his size. These devices were rare and used only sporadically in that conflict. 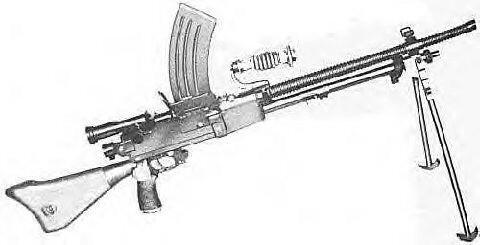 While this gave some added protection in that campaign, the entire concept was judged too impractical for general use and mass production for the Pacific campaigns and were gradually phased out for use. 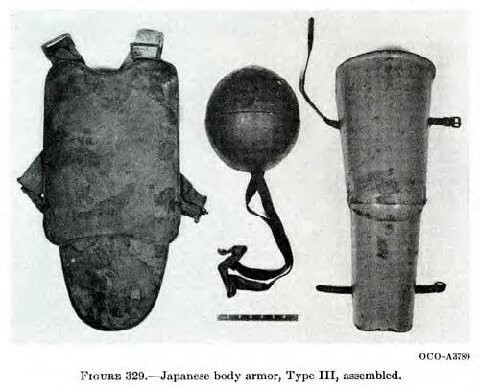 With the war in the Pacific raging and US forces closing in on Japan in the final year of the war, Imperial Japanese Army units began to receive small quantities of experimental body armor in hopes of raising morale. The Japanese were severely limited in both tanks and AFVs in the Pacific and as a consequence took heavy casualties from US forces. 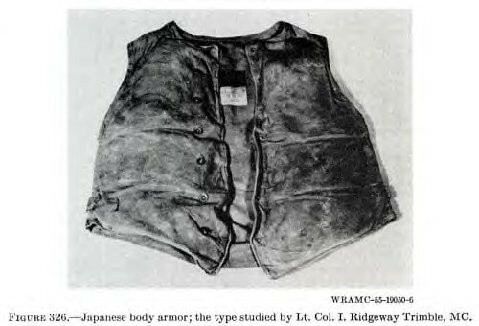 In 1944, in the spirit of the Samurai warriors, body armor was issued in belief that the fighting spirit of the Samurai might take hold and overcome the material power of the US forces. This was not to be and yet the added protection saved many Japanese soldiers who were only wounded instead of being killed outright. 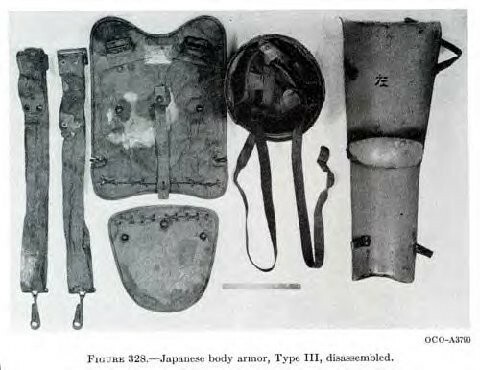 Types I, II, and III armor combinations were encountered by US Marines in tough ground fighting and were shipped back to the US for a thorough examination after removal from both the living and dead Japanese. Lt. Col. 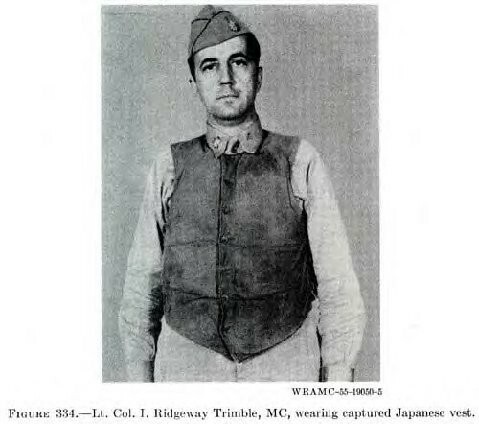 I. Ridgeway Trimble, MC, then chief of the surgical service at the 118th General Hospital, Sydney, Australia became very interested in the captured body armor and pioneered an Allied counterpart. After a great deal of difficulty and personal disappointment, he was able to secure a copy of Japanese armor (fig. 326). 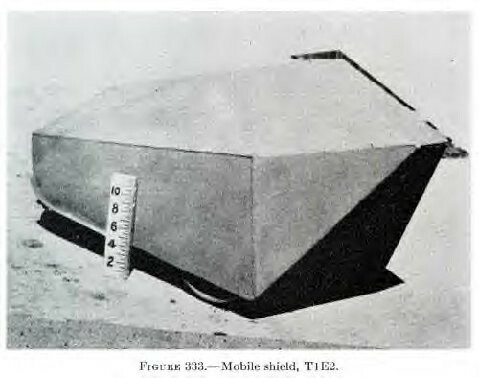 Based on the Japanese design and his own personal observation as to the areas to be protected and the most commonly encountered wounds and causative agents, he developed a model for US ground troop armor. 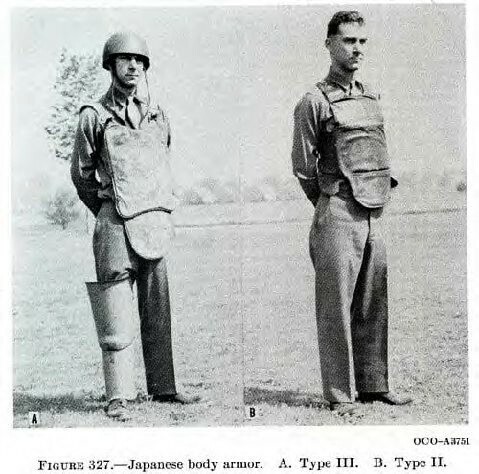 By the summer of 1945 more than 2,200 armored vests and aprons were sent to the Pacific for field testing, but the war ended before any could be utilized. Total production of all four types of <?xml:namespace prefix = st1 ns = "urn:schemas-microsoft-com:office:smarttags" />US body armor until September 1945 equaled approximately 78,000 units! 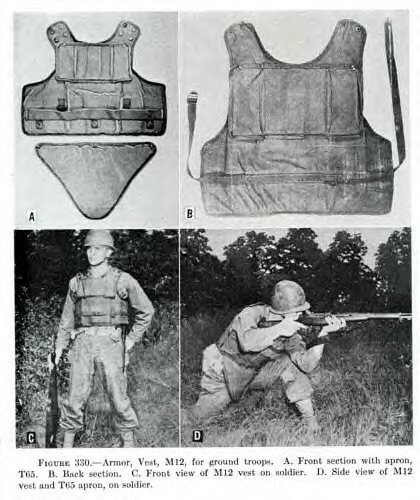 Although they missed World War II, the M12 vest with T65 apron effectively made it to Korea postwar. All due to capture of Japanese body armor in the Pacific.